AddressThe address for this sale in Chesterfield, MI 48051 will no longer be shown since it has already ended. 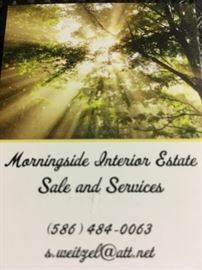 Professionally Guided by Morningside Interior Estate Sales and Services - "Come Do Your Shopping With Us!" 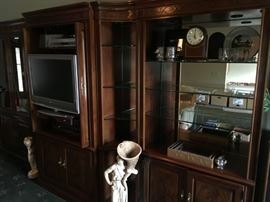 5 piece fine quality wood wall unit by Thomasville. Featuring beveled glass-front doors and glass shelving with ample cabinets for storage. Versatile ways to use as one large unit or section off for different usages in other rooms of the home. 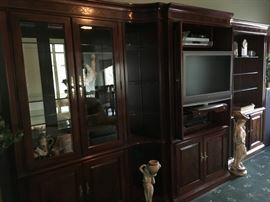 Accented-designed crown molding and beveled glass are only a few mentionables of the wall unit. Accent door front panels, curve side units, and recess lighting make this wall unit upscale elegant in style. 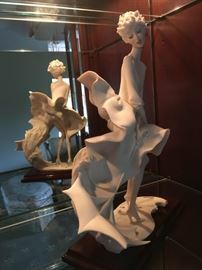 Guisseppe Armani's "The Umbrella Autumn" figurine. 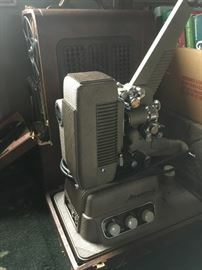 Vintage Rever 16mm sound projector Model S-16. 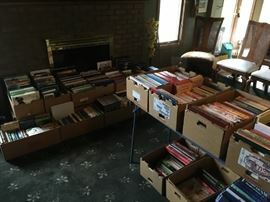 A few hundred of books and magazines. Golf, garden, cook, and health; with a variety of other interesting subjects of matter. 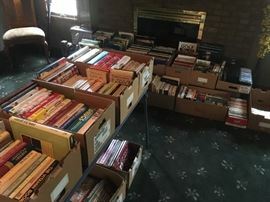 Almost 20 boxes of a library of subjects of interesting reads. 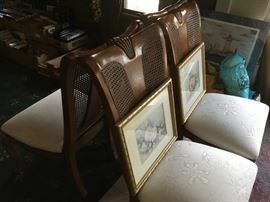 Thomasville fine wood and cane back dining chairs. With framed art work here and there. Half moon shape glass top and accented on a black and gold-tone trim frame. Full length male mink mahogany fur trimmed with fox. And why not. Better now than never. 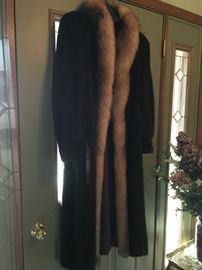 Affordable full length mink that should be worn...just because. Newer like condition and well maintained. His and Her closet full of evening and everyday wear coats and jacket. Of wool, leather, ostrich and nylon. Pretty-in-Pink is this mod design glass globe lighting on a Casablanca ceiling fan. Household goodies of linens, home accessories, and alike. Table worthy of around the home decor and accessories. A pair of stained glass wall sconces, along with many worthy finds of home necessities and goods. Accentuate a empty wall with this whimsical wall piece. Women's clothing worth the search for spring wear. 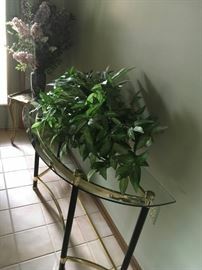 Vintage and newer accent pieces of furnishings and window treatment. Home interior accent room pieces for that finished look. A few hundred of 'this and that" fill the tables and rooms of great finds and worthy keeps. Kitchen knack-knacks, electronics sorts, and floral blooms. Men's clothing worth the search for spring and golf wear. Casablanca and Hunter Fans - Quality Speaks For the Name. Let the fun begin. There after will the eyes be delighted in such a sight of the unbelievable collection in one space - to shop until you fill your every worthy thought of gotta-have "this one too." Just think that there is a place in ones home where complementary and beauty will also bring pleasure. Fun design and pattern are in the eyes of the beholder. 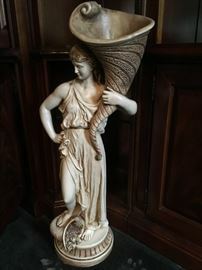 Where once there were of the divine means of eloquence in the home and can once again be. Mini appliances and kitchen wares. A few hundred pieces of kitchen gadgets, knives, and serving utensils. This huge box of pewter flasks made in Sheffield, England would be an idea gift giver or commemorative event. With the ability to engrave. Maybe of a golf outing, a fun-raiser, or a class reunion -endless possibilities. Walnut sideboard is from the 1940's era with a lot of character features of metal cabinet knobs, and scroll moldings on door fronts and back board, that accentuates it's uniqueness. Reebok Trainer RX 3 M# 14010.0 and the Guthy Renker Fitness Power Trainer. Traveling suitcases. Pair EV Speakers, Mackie mixer, Crown power base, Yamaha AMP mixer, Tascam portable vocal trainer, Korg Rhythm, Optimus turn table, Magnavox all-in-one tuner, amplifier, cassette player with speakers. Name Dropping: Ping, MacGregor, Calloway, Odyssey, Tommy Armour, etc. Other notables items in the game of golf. 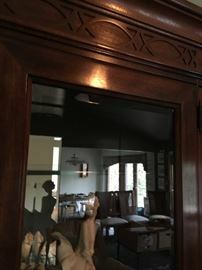 Vintage room divider made of hardwoods. Upper part made with spindles and lower part solid wood design in panels. As captured of the blues of spring irises in bloom -stained glass window panel. Unimaginable of the endless patterns, styles, and manufactures represented in this over 20 years worthy collection, of new, used, vintage and antique of fine dining to everyday and everything in-between. A dish set display on-top of a cedar line wicker storage chest. Crystal, of bowls, servers, vases, glassware, candle holders and etc. are bountiful. Glassware of distinct color spectrum is undeniable note worthy either displayed or when in use. Upon the spring holiday or special occasion the presentation with the many, many platters, plates, or bowls would give that exceptional finish look.